Our Craft Wool is only available to order over the phone. Our Craft Wool is available in natural off-white. These are the bits and pieces that are left over from the wool batting that we use in making our products. 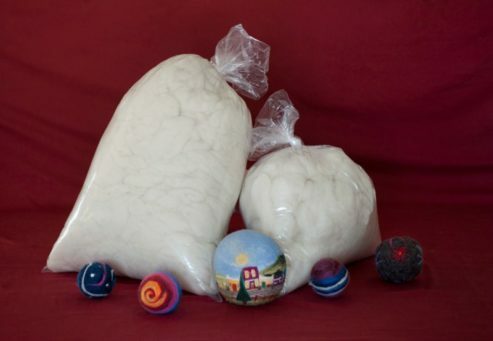 Use these pure wool scrap pieces as the filling for toys or make your own felted crafts. 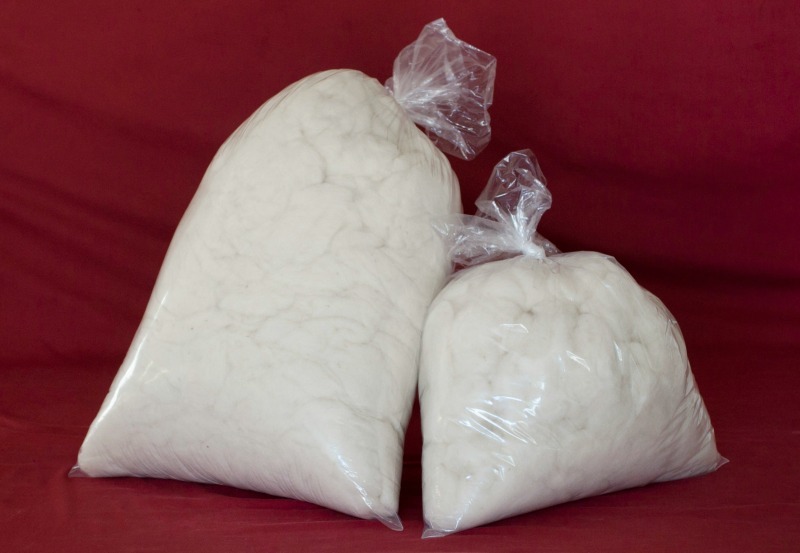 Craft Wool is available in 1 and 5 pound bags. Our Craft Wool is perfect for all of those crafts you have been planning to make. We offer Premium Eco-Wool, a wool blend we have been perfecting locally for decades, as well as Certified Organic Craft Wool. The cleanliness, softness and resiliency of our wool makes it a pleasure to work with. Our Premium Eco-Wool is comprised of wool from local farmers in the Northern California/Southern Oregon area. We have been working with these farmers since the 90’s. Our signature blend has inspired all of our most popular wool bedding: from our 5″ Wool Mattress to our Wool-Filled Snuggle Mate Topper to our All-Seasons Wool-Filled Comforter. Our Premium Eco-Wool is both ethical and sustainable. These are farms we have very close relationships with and we share the same values. Check out our From Sheep to Sheets blog series to learn the details of how we acquire our Premium-Eco Wool blend. We believe in transparency. Our Certified Organic Wool is GOTS certified. This blend comes from New Zealand and is used for all of our Certified Organic wool bedding. By using our Craft Wool you can be assured that you are creating a healthy handcrafted work of art. I ordered the scraps for use as stuffing in felted pillows. I was so excited to receive my two pounds – it’s a good amount of wool, lofty and perfect as stuffing, and looks like it would felt very nicely too (it’s course enough for needle felting but clouded in the batt and not too course, so wet felting shouldn’t be bad with it either). There is a little bit of vegetable matter in it (no more than I’m used to – it’s to be expected) and it has a lovely lanolin smell (but not pungent). I couldn’t be happier. Thank you! This is the best craft wool for the price! It’s clean and Dosn’t have a bad odor. I will definitely purchase again! Thank you! 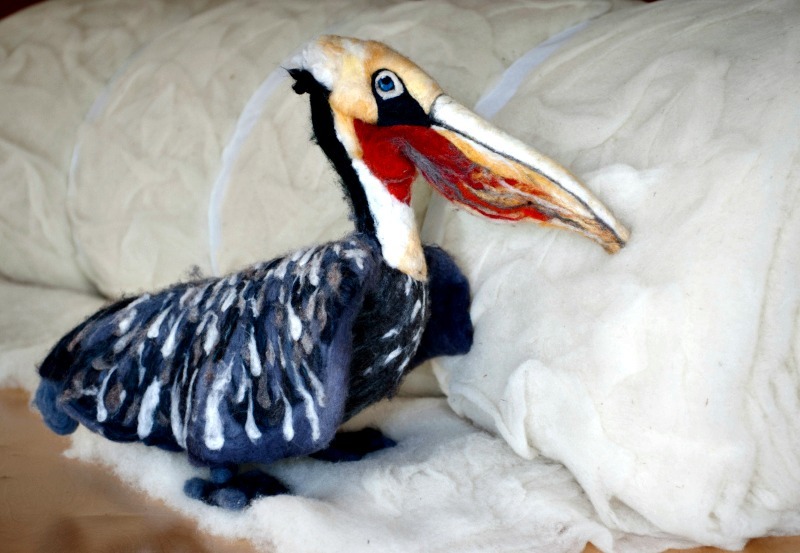 We are super proud of the quality of our wool and are pleased to offer our craft wool to creative people like you! Thank you for your support and have fun!